President of Faithsearch International and another Liar for Jesus. Claims to be a “former skeptic” (the claim is kinda undermined by the fact that his MA was in New Testament Studies) who has become an evangelical, fundamentalist whackjob whose shtick argument is that since there are lots of copies of the New Testament around (written only a couple of hundred years apart and based off of each other), then it must be literally true. 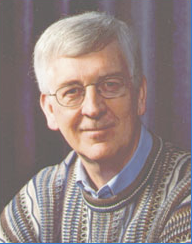 Author of several books on creationism and is an ardent campaigner for it, giving numerous talks and presentations. Accepts Behe’s and Dembski’s discredited arguments for ID (and the Bible) at face value and rejects evolution (which he certifiably does not understand, mixing it up with ‘everything must have occurred by chance’) through an argument from incredulity. Briefly discussed here. Diagnosis: Dishonest (unintentionally? ), pernicious godbotter; impact unclear, but he is probably a minor figure. This guy met my mother at a Christian conference, and promised that he would do his best to re-convert me if mom could get me to read his book. Well, she had one mailed to me, so I slogged through it, and then emailed him. He never replied. The second link is broken: try https://scienceblogs.com/pharyngula/2006/06/20/a-serious-question-how-do-you instead.